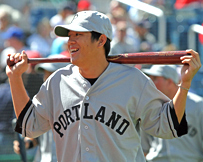 2011 has been a breakout year for Portland right fielder Chih-Hsien Chiang, culminating with his recent selection to the World team at this summer’s XM All-Star Futures Game in Arizona as part of Major League Baseball’s All-Star Week. Through June 29, Chiang leads the Eastern League with a .616 slugging percentage, an unbelievable 80 points higher than any other player. He is also second in the league in RBI with 50, fourth with 21 doubles, and tied for seventh with 13 home runs. At a recent game in Manchester, I got the chance to talk with Chiang, with the help of coach Mickey Jiang, who interpreted (thanks Mickey! ), about adjusting to the United States, playing internationally, and his breakout season. Chris Hatfield: Congratulations on being selected to the Futures Game. When did you find out, and how did it feel to be selected? Chih-Hsien Chiang: Yesterday, our manager, Kevin Boles, pulled me into his office. I didn’t know what was going on. I was kind of nervous until they told me I’d been selected to the Futures Game for the World squad. I was so excited. I will treasure this opportunity. CH: You’ve been hitting well, dating back to even last August. What has led to this stretch of success for you at the plate? CC: I try to be more consistent, day in and day out with my routine, how I swing the bat in the cage, in BP, and put it into the game. If I do that, the numbers will come up. That’s the only thing I’m working on. CH: Since you’ve been in the system, what changes have you made at the plate, dating back from, say, the Gulf Coast League to now? CC: I think being more selective. I can recognize pitches better, and I try to get better and better each year. I don’t want to go backward. I think the hitting approach is what I have learned since the first year I was here. CH: It’s your third season playing the outfield. At this point, how comfortable are you out there? What aspects do you feel you still need to work on, and what do you feel that you’ve more or less mastered at this point? CC: When they first tried to convert me to play outfield, it was during (the Fall Instructional League). I had no clue how to play a decent outfield. So I started working with our outfield coordinator in Instructs, spring training, and even during the season when he’d come down, we’d talk. Che-Hsuan Lin is also a great help for me, because he plays outstanding defense out there. I’ve learned a lot from him. As for what I’m working on right now, of course I feel more comfortable year by year. Even though they moved me from left to right last year, I have no problems with fly balls and whatever. Things I’m working on, I’m trying to get better reads on balls over my head. CH: You’ve had the opportunity to play in the Olympics and the World Baseball Classic for Taiwan. Can you describe the experience of getting to represent Taiwan in those two competitions? CC: It was an exciting experience for me to play with so many talented players from different countries. That was a great experience. Watching them play, and playing against them, you can learn from them, which made me a better player. CH: Adjusting to playing in the U.S., how difficult was that and what was the biggest thing you had to adjust to on the field? CC: I’d say the weather is huge. My first year in the GCL, the weather compared to Portland in Double-A is totally different. Playing in the South Atlantic League and Carolina League, it’s totally different. The weather is colder and chilly up here, and I have to get myself loose, spend more time stretching, stuff like that. That is a big factor for me making the adjustment to playing here. CH: In the system, you’ve been able to play with a few other Taiwanese players – you mentioned Che-Hsuan Lin, but there have been a few others as well (ed. 's note: e.g. Chih-Hsiang Huang and Wang-Yi Lin). Has that helped with adjusting to playing in the United States and your overall level of comfort? CC: Of course, if we do have more players from the same place, who speak the same language, that’d be awesome, but I’m still working on communicating with my teammates better. Playing with players from my country, it’s a great experience, and we hang out off the field. CH: You’ve always been pretty young for the level you were at, especially lower in the system. How has that affected you either on the field or off the field? CC: It’s not a big difference playing with older guys. I take every level my first year there as a challenge. The more challenge I have, the more motivated I will be to overcome it. It’s fun to hang out with the older guys because I can learn from them. CH: How often do you get to communicate with your family during the season? CC: There’s no certain frequency that I call back home. If I have a good day, I want to share that with my family if possible. If I have a bad day, it’s okay, I don’t want to share those bad feelings. I feel more comfortable talking with my family when I have a good day. CH: So if you’ve been talking to them on the good days, does that mean you’ve been talking to them a lot recently? CH: During the offseason, do you get to go back home to Taiwan, and for how long? CC: I have four months off during the offseason. During the first month the organization just wants me to shut down and just rest. In the second month of the offseason, I start doing some light workouts, following our strength and conditioning program, and working out with some baseball players back home, trying to get in shape. Two months before spring training, I start to get back on track and get ready for spring training and compete. CH: What do you like to do off the field in your spare time? CC: I like to go sight-seeing, whether in Boston or Portland. I like to find good food, I’ll try anywhere. CH: Any favorite spots since you’ve come to the U.S.? CC: There’s no particular one, but I enjoy staying in different cities. Every year, I move to a different city, so I try to find the famous spots and get to know the city better. I enjoy this life.